Care team at Levine Cancer Institute helps make woman’s dream come true. In July 2013, Becky Yonker was diagnosed with a stage-four brain tumor. After months of treatment her chemotherapy stopped being effective, causing her care team to take action with new treatments. While her future is still uncertain, the care team at Levine Cancer Institute strives to make the most of the time she has. When they found out she would turn 33 on September 22, doctors, nurses and staff planned a surprise that would fulfill one of Becky’s dreams: marrying the love of her life, fiancé Jarrod Bradley. The wedding took place October 9, at St. Mary’s Chapel in Charlotte, NC. Everything for the wedding was donated, from the venue and the music, to the food, decorations, and the photographer. 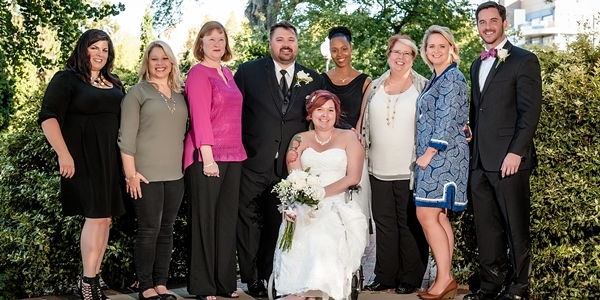 Becky Yonker, (in front) , and her fiance', Jarrod Bradley (standing behind her) were surprised with a beautiful October wedding helped planned by her care team at Levine Cancer Institute (from left) Ashley Sumrall, MD, FACP, Serena Perera, Ann Elrod, LeKeesha Miller Jackson, MSW, LCSW, Ann Marie Pauly Melissa Waller and David Jennings. “The wedding planning restored my faith in humanity,” says Miller Jackson. “To see this community come together for Becky proved to me how great it really is. Everyone we asked said, ‘whatever you need, count us in.’” It was a touching gesture that honored a couple whose relationship began in the Queen City. They met at a mutual friend’s party and later had their first date at Alexander Michael’s restaurant in Charlotte. From there, they were inseparable. Jarrod continues to support his wife every step of the way, in any way he possibly can. He truly is Becky’s partner in life.